LOUISVILLE, Ky. — A Cooperative Baptist Fellowship pastor was honored September 11 at a summit focused on racial justice to commemorate the 60th anniversary of the desegregation of Central High School in Little Rock, Arkansas, and to honor the Little Rock 9, the nine black students who bravely attempted to start classes at the all-white school on September 4, 1957. Dr. Kevin Cosby (left) present Rev. Wendell Griffen (right) with Little Rock 9 honor at The Angela Project Conference. Photo Credit: Rico Ransom. Rev. Griffen, who is also an Arkansas Circuit Judge, faces disciplinary action, including possible impeachment, after participating in a Good Friday prayer vigil with members of his congregation in front of the Arkansas Governor’s mansion, where Griffen laid on a cot silently and in solidarity with Jesus Christ, after deciding on a case related to property rights over execution drugs. CBF leaders joined other faith leaders from across the country on June 9 at a religious freedom rally in Little Rock to show their support for Griffen’s right to express his religious beliefs as an elected officials. The recognition of Griffen came at The Angela Project Conference, a gathering of Baptists from the Cooperative Baptist Fellowship, National Baptist Convention of America International, Inc., and the Progressive National Baptist Convention focused on racial justice. The Angela Project hosted by Simmons College of Kentucky and Simmons President and St. Stephen Church pastor Dr. Kevin Cosby, aims to assist African-American institutions and promote African-American prosperity and will commemorate the 400th anniversary of black enslavement in the United States at the third conference in 2019. This September 11 gathering was the first of three conferences focused on racial justice. Griffen reflected on the 60th anniversary of the desegregation of Central High School, urging the attendees to pray for public education. Tags: angela project, Kevin Cosby, racial justice, Racial Reconciliation, wendell griffen. Bookmark the permalink. A very well deserved honor. 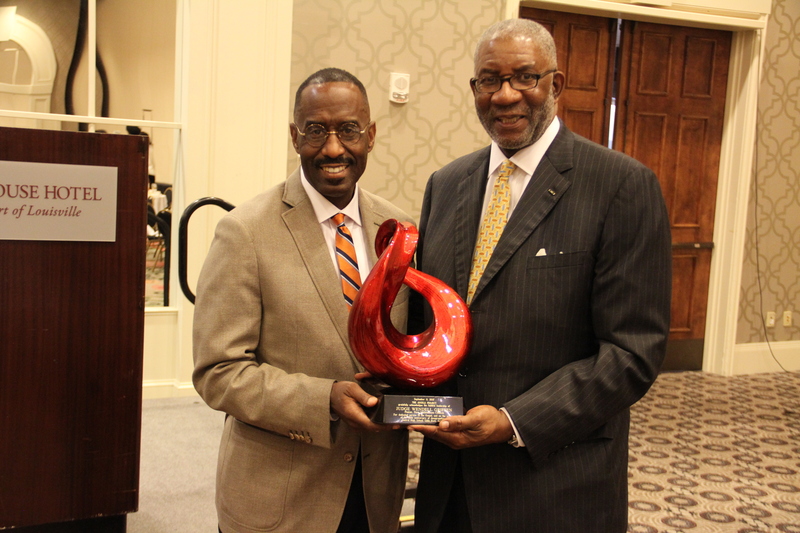 Those of us who love Little Rock contnuingly honor Wendell Griffen for his unwavering perseverance to create justice in the Little Rock community.